I have a question about a picture from NASA 's BATSRUS Magnetosphere simulator from 07 January 2017! Can ZETA give more explanation what we look at? From what pictures and videos I see in the last years from BATSRUS I did not remember to see the blue Field in that position. .It seems that is a strong flow that is coming from south of the elliptic some warping the earth magnetic field, earth axis is also is leaning, black flow Lines behind the earth are definitely tangled! Second question related: also the magnetic turbulence behind earth field it seems that are few per week is constant almost every 2 -3 days! This type of magnetic turbulence interference-assault, will be an linear increase for now-on or will be in stages? 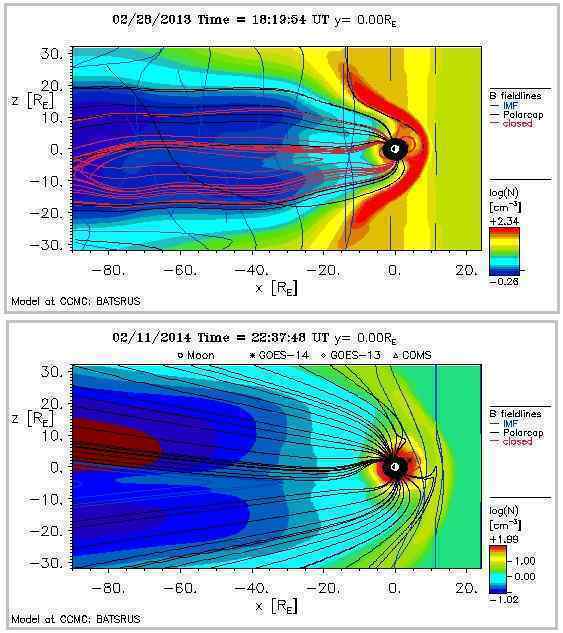 BATSRUS modeling shows the Earth’s magnetosphere from the side, with the bowshock absorbing the Sun’s blast on the right and the magnetosphere streaming out behind the Earth to the left. When Nibiru was approaching the Earth from the direction of the Sun, pointing its N Pole directly at the Earth, the Earth either tried to remain aligned with the Sun, or tilt its N Pole away, or tilt into opposition as it did in September of 2012. Opposition was modeled on BATSRUS with the dipole showing the N Pole of Earth tilting toward the Sun at that time. As Nibiru moved to the right of the Earth, the extreme blast from the N Pole of Nibiru seemed to come from the side, as it did in February, 2014. Here the dipole showed the N Pole of Earth tilted somewhat away from the Sun and Nibiru also, which is also due to the tilt of the Earth during Winter in the Northern Hemisphere. 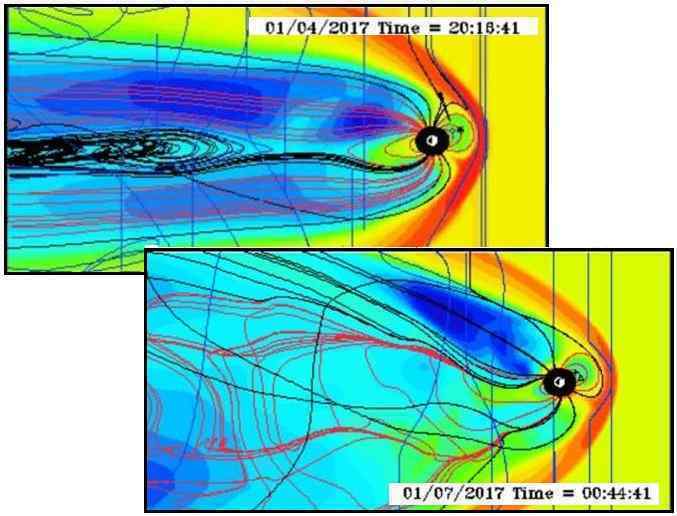 For a period of time in October, 2016 it was noted that the Earth’s magnetosphere seemed to be hugging close to the Earth, a defensive maneuver. And now in January, 2017 yet another bizarre phenomena has been noted showing the dipole lean of the N Pole of Earth such that it is tilting its N Pole away from the Sun and the approaching Nibiru. Though it is Winter, and the dipole lean should reflect this in a slight lean, the magnetic poles are still trying to be aligned with the Sun. 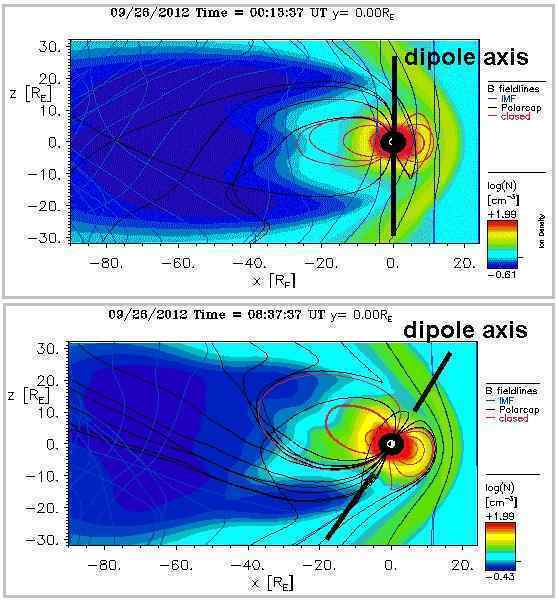 This dipole lean is extreme, and the confused magnetic field behind the Earth indicates a lean away from the Sun, pushing the N Pole of Earth away in a posture that would be expected during the 3 Days of Darkness. This is temporary, notably recorded by BATSRUS at midnight in Geneva, when the Polar Push is occurring over the Pacific. Further examples of a confused magnetic field during the daily Polar Push recorded near 00:00 UTC today. 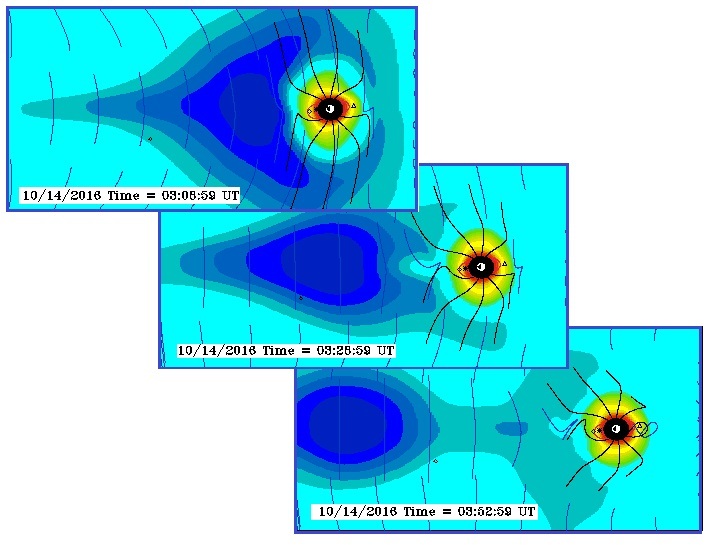 Today's BATSRUS depictions of a confused magnetic field with dipole lean away from the Sun around midnight in Geneva (23:00 UTC). Another example of a "confused magnetic field behind Earth indicating a lean away from Sun" recorded on January 8. Note the dipole lean and the time at approximately Midnight in Geneva.